From Flickr: “Katharine Hepburn” by Truus, Bob & Jan too! French postcard by Viny, no. 2131. Photo: R.K.O. Katharine Hepburn (1907-2003) was an indomitable American stage and film actress, known as a spirited performer with a touch of eccentricity. She introduced into her roles a strength of character previously considered to be undesirable in Hollywood leading ladies. As an actress, she was noted for her brisk upper-class New England accent and tomboyish beauty. 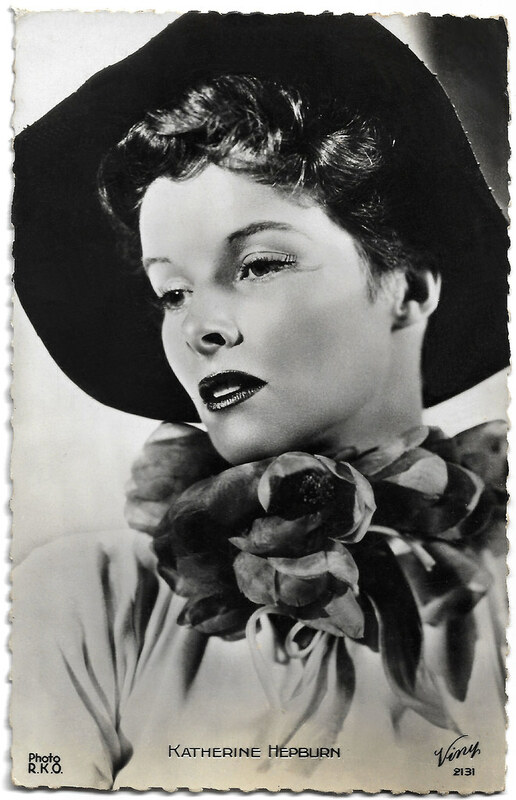 Katharine Houghton Hepburn was born in 1907 in Hartford, Connecticut, U.S. Her father was a wealthy and prominent Connecticut surgeon, and her mother was a leader in the woman suffrage movement. From early childhood, Hepburn was continually encouraged to expand her intellectual horizons, speak nothing but the truth, and keep herself in top physical condition at all times. She would apply all of these ingrained values to her acting career, which began in earnest after her graduation from Bryn Mawr College in 1928. That year she made her Broadway debut in Night Hostess, appearing under the alias Katharine Burns. Hepburn scored her first major Broadway success in The Warrior’s Husband (1932), a comedy set in the land of the Amazons. Shortly thereafter she was invited to Hollywood by RKO Radio Pictures. Hepburn was an unlikely Hollywood star. Possessing a distinctive speech pattern and an abundance of quirky mannerisms, she earned unqualified praise from her admirers and unmerciful criticism from her detractors. Unabashedly outspoken and iconoclastic, she did as she pleased, refusing to grant interviews, wearing casual clothes at a time when actresses were expected to exude glamour 24 hours a day, and openly clashing with her more-experienced coworkers whenever they failed to meet her standards. She nonetheless made an impressive movie debut in George Cukor’s A Bill of Divorcement (1932), a drama that also starred John Barrymore. Hepburn was then cast as an aviator in Dorothy Arzner’s Christopher Strong (1933). For her third film, Morning Glory (1933), Hepburn won an Academy Award for her portrayal of an aspiring actress. However, Katharine Hepburn’s much-publicized return to Broadway, in The Lake (1933), proved to be a flop. And while moviegoers enjoyed her performances in homespun entertainments such as Little Women (1933) and Alice Adams (1935), they were largely resistant to historical vehicles such as Mary of Scotland (1936), A Woman Rebels (1936), and Quality Street (1937). Hepburn recovered some lost ground with her sparkling performances in the screwball comedies Bringing Up Baby (1938) and Holiday (1938), both of which also starred Cary Grant. However, it was too late: a group of leading film exhibitors had already written off Hepburn as “box office poison.” Undaunted, Hepburn accepted a role written specifically for her in Philip Barry’s 1938 Broadway comedy The Philadelphia Story, about a socialite whose ex-husband tries to win her back. It was a huge hit, and she purchased the motion picture rights to the play. The 1940 film version—in which she reteamed with Cukor and Grant—was a critical and commercial success, and it jump-started her Hollywood career. She continued to make periodic returns to the stage (notably as the title character in the 1969 Broadway musical Coco), but Hepburn remained essentially a film actor for the remainder of her career. Her stature increased as she chalked up such cinematic triumphs as John Huston’s The African Queen (1951), in which she played a missionary who escapes German troops with the aid of a riverboat captain (Humphrey Bogart), and David Lean’s Summertime (1955), a love story set in Venice. In Long Day’s Journey into Night (1962), an adaptation of Eugene O’Neill’s acclaimed play, Hepburn was cast as a drug-addicted mother. Katharine Hepburn won a second Academy Award for Guess Who’s Coming to Dinner (1967), a dramedy about interracial marriage; a third for The Lion in Winter (1968), in which she played Eleanor of Aquitaine; and an unprecedented fourth Oscar for On Golden Pond (1981), about long-married New Englanders (Hepburn and Henry Fonda). Her 12 Academy Award nominations also set a record, which stood until 2003, when broken by Meryl Streep. In addition, Hepburn appeared frequently on television in the 1970s and ’80s. She was nominated for an Emmy Award for her memorable portrayal of Amanda Wingfield in Tennessee Williams’s The Glass Menagerie (1973), and she won the award for her performance opposite Laurence Olivier in Love Among the Ruins (1975), which reunited her with her favourite director, Cukor. Though hampered by a progressive neurological disease, Hepburn was nonetheless still active in the early ’90s, appearing prominently in films such as Love Affair (1994), which was her last movie. Hepburn was married once, to Philadelphia broker Ludlow Ogden Smith, but the union was dissolved in 1934. While filming Woman of the Year in 1942, she began an enduring intimate relationship with her costar, Spencer Tracy, with whom she would appear in films such as Adam’s Rib (1949) and Pat and Mike (1952); both were directed by Cukor. Tracy and Hepburn never married—he was Roman Catholic and would not divorce his wife—but they remained close both personally and professionally until his death in 1967, just days after completing the filming of Guess Who’s Coming to Dinner. Hepburn had suspended her own career for nearly five years to nurse Tracy through what turned out to be his final illness. In 1999 the American Film Institute named Hepburn the top female American screen legend of all time. She wrote several memoirs, including Me: Stories of My Life (1991). Katharine Hepburn died in 2003 in Old Saybrook, Connecticut. Sources: Encyclopaedia Britannica, Wikipedia and IMDb. From Flickr: “Lana Turner” by Truus, Bob & Jan too! From Flickr: “Noël aux Galeries Lafayette, Paris” by Yvette G.